We’ve gotten pretty good at handling natural disasters over the past few years. While there is a great deal of planning that goes into such an event, we would never be able to pull it off without our staff. 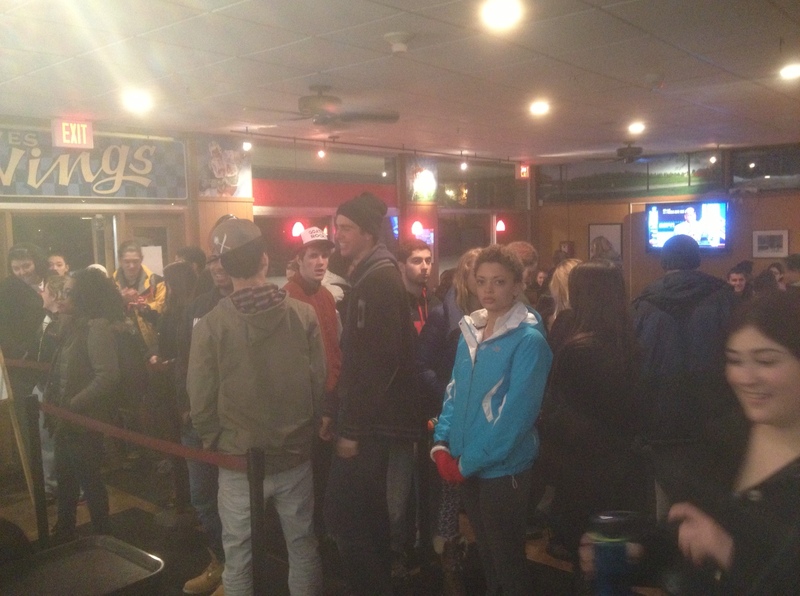 Both full-timers and students made their way through the storm to keep the lights on and our customers fed. These were the people who fed hundreds of you including over 700 just at dinner alone. That’s 700 meals MADE TO ORDER. We broke our record set during the dinner after Blizzard Nemo in 2013. We are very thankful to them and to our customers for their patience and understanding during a very busy day and stressful couple of days. While we usually close at 2pm and re-open at 5pm, we are staying open all afternoon serving lunch. Dinner specials will begin at 5pm. We’re getting done. We will be opening at 11:30 AM. 1 Hour Delay. 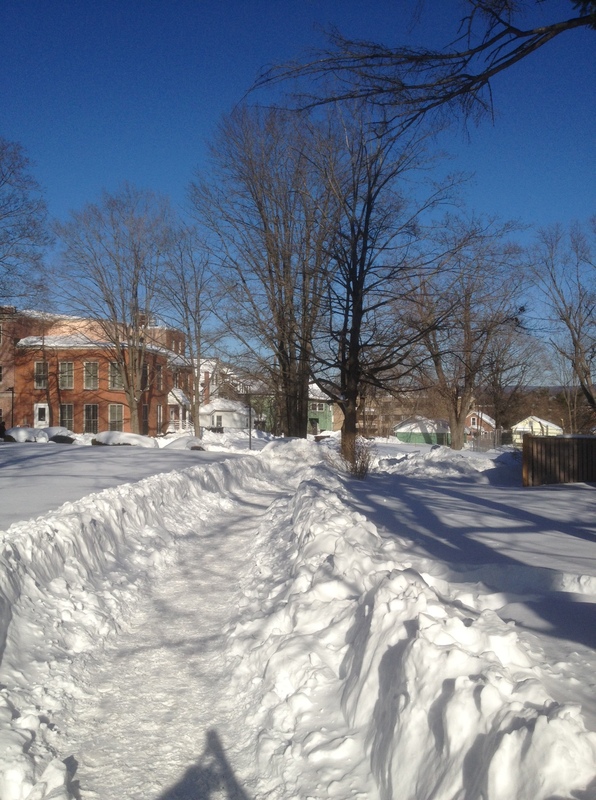 Our staff is slowly making it in and Wesleyan grounds is plowing and digging us out. At his time we are planning for a 12 noon opening. We will continue to update if we are able to open sooner or if there is a further delay. We are in contact with our staff and assessing conditions. We will be updating at 10:00 am to let everyone know if we will open on time at 11:00 or if there will be a delay. Broad Street Books and Red & Black Cafe will be CLOSED Tuesday. Depending on the severity of the storm there may also be a delayed opening on Wednesday. WesWings is still planning on opening on Tuesday. We will update if there are any changes or delays. Hey juniors and seniors, remember how much fun we had two years ago? So the latest is for a blizzard starting Monday night going until Tuesday night. Couple of feet of snow, 50 mph winds blah blah blah. We have been busy planning for this latest event. As of Sunday 8pm: Both locations plan to be open during the storm. We will be meeting with the staff at Broad Street Books Monday to discuss contingency plans for the bookstore and cafe. It is possible there will be either a delayed opening or closure on Tuesday. We’re not sure how everyone else feels, but at WesWings and the Red & Black Cafe, we’re getting a little tired of this whole extreme weather global climate change thing. We are very proud of our staff at WesWings and the fact that we remained open throughout the entire event. WesWings’ staff was incredible throughout. On Friday, most of our full-time and student staff reported for dinner. After dinner, our chef Bill Nardi, walked to the Middletown Inn (his weekend accommodations) in blizzard conditions as did many of our other employees. By Saturday morning as we all awoke to upwards of three feet of snow, Bill returned to WesWings to prepare for the day. The grounds crew from Stonehenge cleared a path both in the parking lot and through the side yard to allow students to get to our front door. With a pared down menu, we served between 500-600 students brunch. 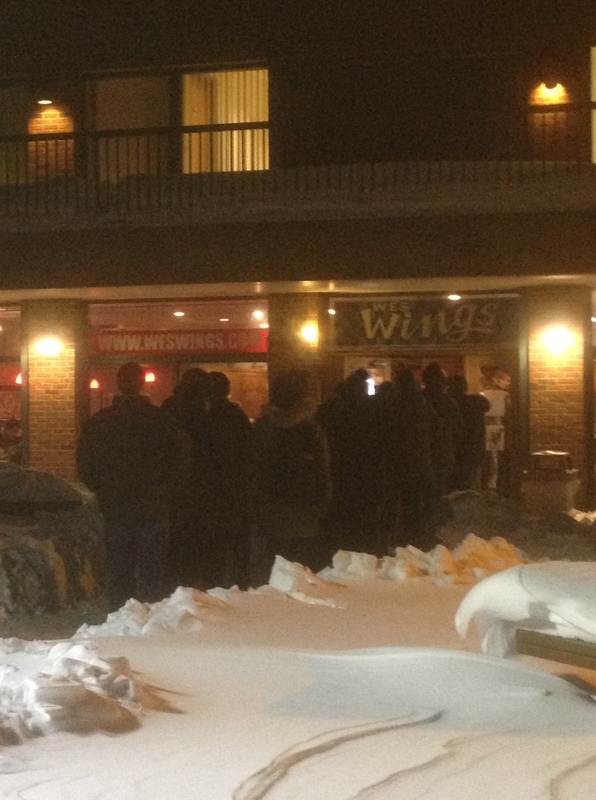 It was the busiest brunch in the history of WesWings. Over two hundred breakfast pails alone. Dinner went down as the busiest as well with over 700 students fed during the three-hour period. That’s an average of one customer every fifteen seconds, for three hours MADE TO ORDER. The line stretched to the parking lot the entire night. While we may have made a few mistakes, everyone was patient and it was never anything so bad that a little cookie dough couldn’t fix. By Sunday, Karen and Ed were both able to travel to Middletown to help. The numbers were similar to Saturday. Sunday brunch become the new number one, and dinner a close second to Saturday. The line still stretched out the door. The crowds inside were pretty intense as well. While we owe so many of our employees a great deal of thanks, it was the Saturday crew that held it all together in our absence. Rick Kmietek, cook/fastest sandwich maker ever! We hope we didn’t miss anyone and if we did, please send us a comment and we’ll update accordingly.